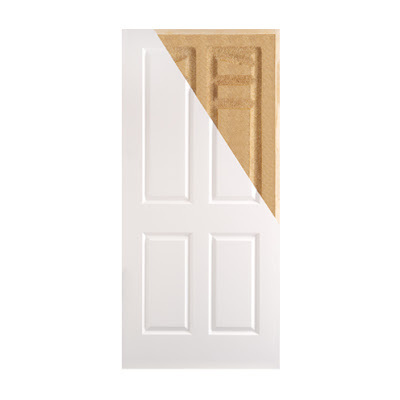 When you want to reduce room to room noise in your home, solid core doors are the way to go. The added mass helps dampen room to room noise transmission. If you wish to improve their effectiveness your going to have to create a tight seal all the way around the door. Sound will be through any spaces air can travel through. Solid core doors can be expensive, so that is why most people opt for the hollow core doors. However, you do have options and you can be green. These solid core "green" doors made by Masonite are not made from solid wood. Instead they are made from wheat straw, a process that the manufacturer calls "DorCor" made from wheat straw. So we have a sustainable door made wheat straw which is fast growing and renewable, pre-consumer recycled content, and has low formaldehyde emissions. There is no added urea-formaldehyde and the door is Forest Stewardship Council (FSC) certified. The doors also have a 20 minute fire rating. Available in both 1-3/8" and 1-3/4" doors, 20-minute Fire Rated available in 1-3/4"